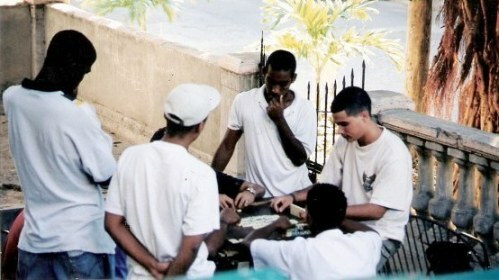 Games of dominoes can be seen throughout Cuba. 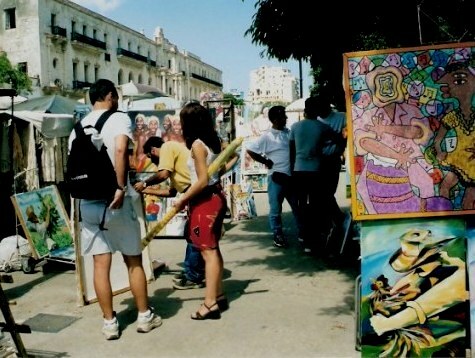 In Havana the pleasure is not just for the players. 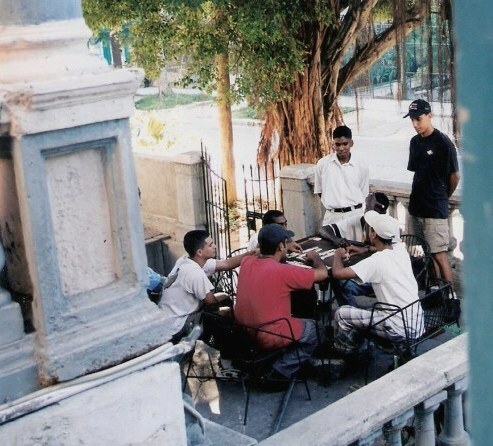 Baseball might seem to be the national sport of Cuba, but a game of dominoes is for all to enjoy - and you see it being played all over Havana, like this serious group playing or silently observing, near the University. 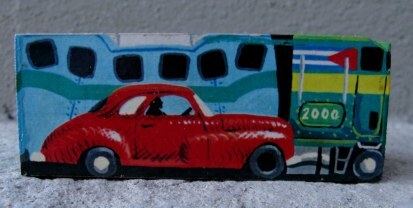 Both are required to be a respected dominoes player – and the skill speaks well for the development of creative and strategic thought that is the hallmark of people in Cuba – people who have made innovation an art form with their solutions to everyday problems. 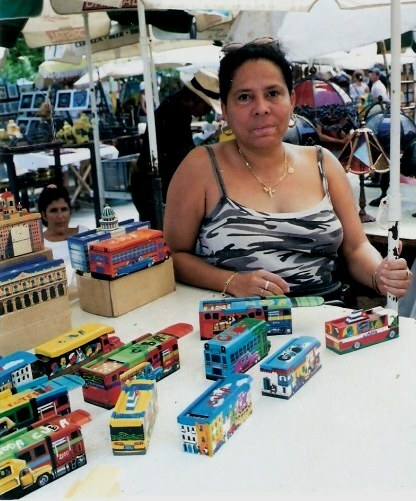 In the craft market one day I saw a stall selling dominoes in boxes that were works of art in themselves. I couldn’t resist – and ended up buying five. 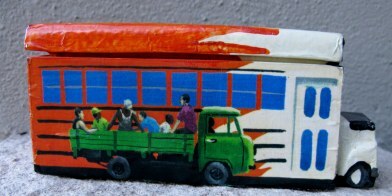 Many were painted as if to replicate the Camelos – long improbable buses made from semi-trailers that were used to transport hundreds of people at a time in stifling heat and close bodily contact. …trucks jammed with people, like those you see waiting on the highways beside the man in the yellow jacket that shows he is an official human taxi control centre. He gathers destinations and matches them to the passing vehicles, despatching people accordingly. 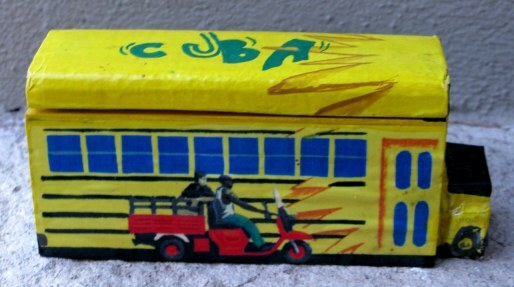 …and on the smaller domino boxes, there are smaller Classicos of more humble status, painted beside the smaller buses like those that ply the routes from Habana Centro to the barrios and to nearby districts. On another is one of the then newly introduced Chinese motorbikes. 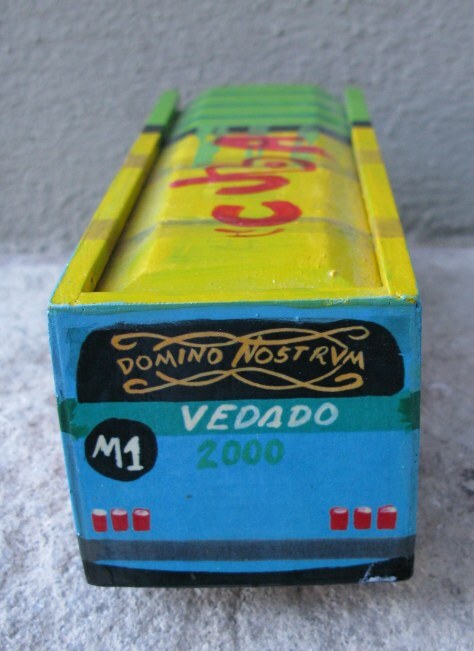 As with so many things in Cuba, in creating these artistic domino boxes the opportunity is not lost to leave you with some typically ironic Cuban humour. 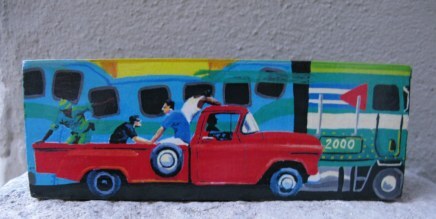 …and on the rear window, a clever word play. 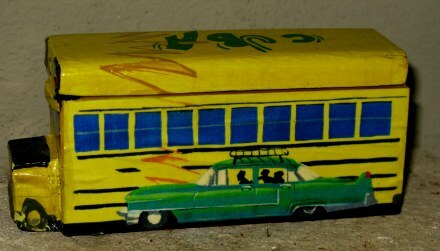 At any rate, each of the painted boxes holds a complete set of carefully made dominoes, and they are regularly used in my home. 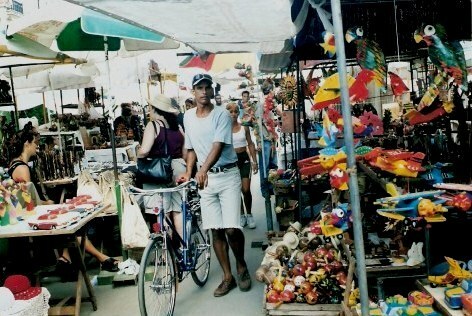 It’s worth visiting more than once because the vendors vary. I didn't see the Domino people again. Dominos: is their box a craft, an art, or both? For the purists among those reading, you may be mulling over the much debated question that often arises about such things as my domino boxes. This is an unending debate: What constitutes one as against the other? I find them quirky. I like them - and that is good enough for me – and rather than leap into that discussion, I prefer to look at my domino boxes as really fine design. Millard Sheets is recognised as the founder of what later came to be known as the California Water Colour Movement. In addition to water colours and illustrations, he painted murals, was a printmaker, and notably also an architect. and a deep reverence for the love of life. 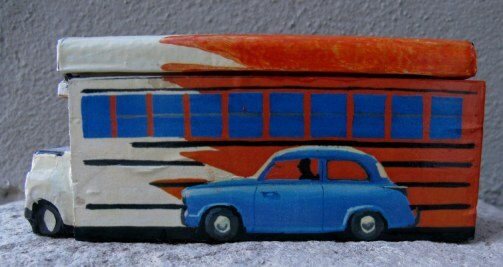 The painted Cuban domino boxes would not be classed as great art by many but for me these qualities qualify them as very good design. 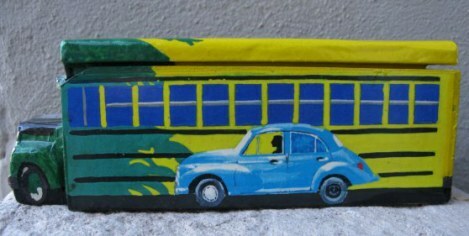 witty, colourful, and timeless in appeal.